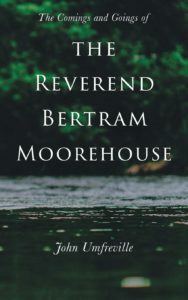 The Comings And Goings Of Reverend Bertram Moorehouse by John Umfreville is a historical book about a family in a small town in the late nineteenth century. The style is reminiscent of other books I have read about the English countryside written in the 1930’s. The book has an olde worlde charm to it and as you read, you are never quite sure if this is fact or fiction. There was something very soothing about the narrative as the reader ‘experienced’ life in a small town in Victorian Britain. The temperance movement was large at the time. Any alcohol imbibed was seen as scandalous, especially if it was by a man of the cloth, whether it was intentional or not. The small town was a hotbed for gossip. Appearances were important. Tragedy strikes rather than have scandal erupt. The reader is treated to geographical and historical facts as the novel moves from India to England to Australia and returns to England via the Boer War. It was all rather exciting and fascinating. I really enjoyed this book. It was a complete departure from my usual genre but it had an ethereal charm to it. It is the perfect way to pass an afternoon.